When I was in high school, I was one of the most organized kids around. I was never late with a home work assignment, managed to juggle a slew of student council activities, act in school plays and still have time for hanging out with friends. These days, I feel like I exert twice as much energy for half as much coordination. I do realize that there are far more moving pieces in my life these days (in high school, I wasn’t responsible for so many of the household tasks that now fill my brain), but I often wish I could recover some of the boundless energy I once had for pulling loose ends into neat bundles. Here’s an example of my organizational struggle. In the fall of 2010, the publicity manager for Robert Rose publishing sent me a handful of books that she thought might be appropriate for this site. 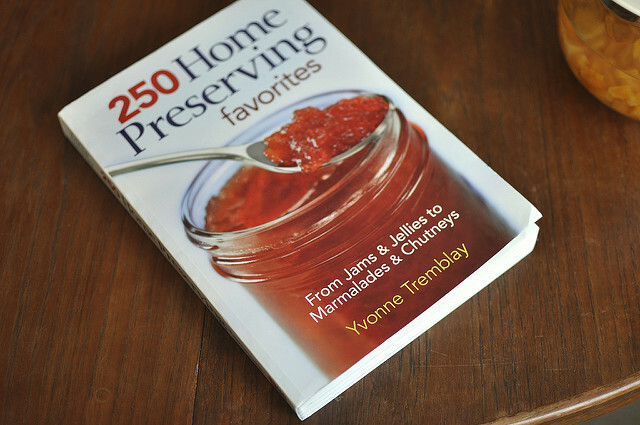 I worked a couple of the volumes into blog posts and set aside the copy of 250 Home Preserving Favorites by Yvonne Tremblay for future blogging. My plan was to spend some serious time with it and devote a post to it. Instead, I misplaced it. It totally disappeared from the landscape of the apartment. Nearly a year later, I got an email from Yvonne, the author of 250 Home Preserving Favorites . Not knowing that I’d gotten and lost a copy of her book, she was writing to find out if I’d be interested in seeing a copy for possible inclusion in a blog post. Both Yvonne and Martine (the PR contact from Robert Rose) forgave me my disorganization and sent another copy of the book. Six months ago. My 16 year old self would have been far more on top of it. Now it’s time to make amends to Yvonne and Martine and get my act together in order to tell you all about this most excellent book. It’s a comprehensive volume dedicated primarily to sweet preserves (there’s a section of tangy chutneys near the back that keep it from being entirely sweet). I regularly flip through it looking for inspiration and it’s never failed to spark an idea that sends me dashing to the kitchen. 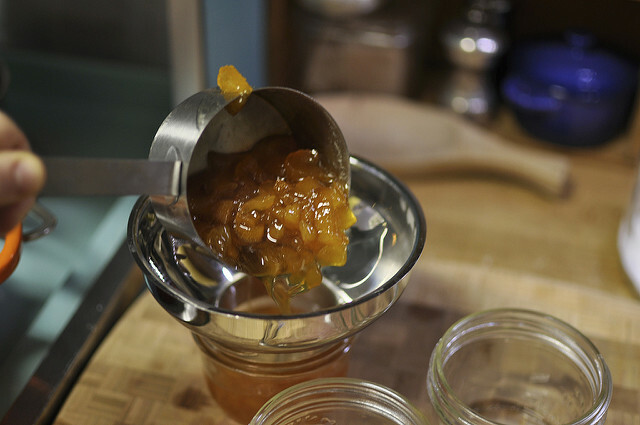 I recently took the recipe for Dried Apricot Jam for a spin and was entirely pleased with the results. The finished product is deeply flavored, with a texture that is somewhere between a jam and a marmalade. I cut the batch in half to keep things manageable and it adapted easily. I’m so happy to have been introduced to the concept of making jam from dried fruit (it’s not something I’d really considered until finding this recipe). It’s also the perfect thing for those of you out there who are anxious for the canning season to get under way. A jam made from dried fruit is just the kind of thing to keep you satisfied until the spring produce starts to get going. Here’s how it works. Chop up 8 ounces of dried apricots, place them in a bowl and cover them with 2 3/4 cups filtered water. Cover the bowl with a plate or a length of plastic wrap and let it sit overnight. The next day, the apricot pieces should be nicely plump. When you’re ready to cook the jam, pour the soaked apricots into a large, non-reactive pot with 2 tablespoons lemon juice and bring to a boil. Cover the pot, reduce the heat to low and simmer for 30 minutes. Once the apricots are quite tender, raise the heat and stream in 2 1/2 cups of granulated white sugar and 1 teaspoon good vanilla extract (I used vanilla instead of the recommended liqueur). Bring to a boil and cook over high heat until the liquid is reduced and the jam has become quite thick and sticky. When it passes the plate test, it is done. Funnel jam into prepared jars, leaving 1/4 inch headspace. Wipe rims, apply lids and rings and process in a boiling water bath canner for 10 minutes. When time is up, remove jars from canner and let them cool on a folded kitchen towel. 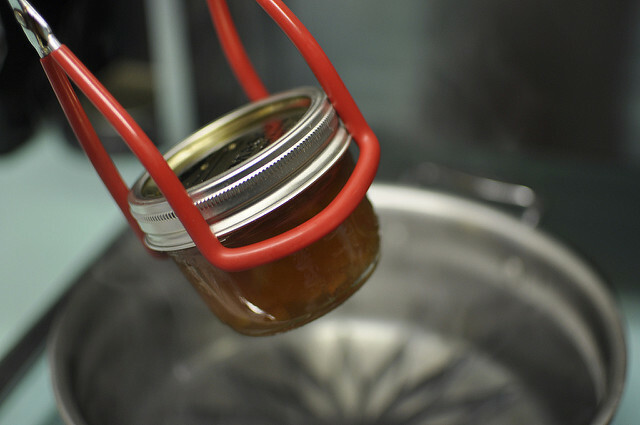 Once jars are cool enough to handle, remove rings and test seals. Any unsealed jars should be refrigerated promptly. Sealed jars can be stored in a cool, dark place for up to a year. For more inspired recipes like this one, make sure to check out 250 Home Preserving Favorites . I’m so glad you posted this (and re-discovered the book!) 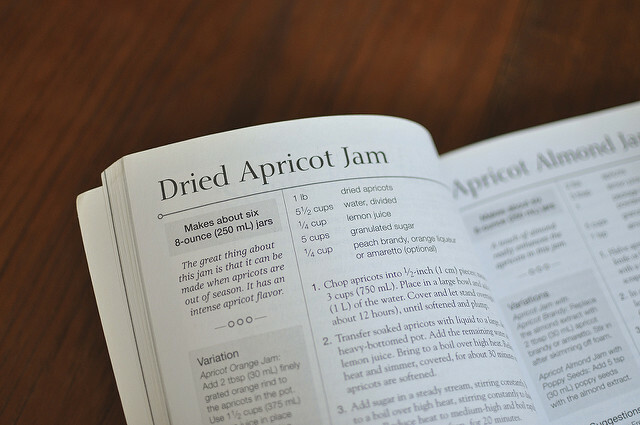 I have seen a similar recipe in Darina Allen’s Forgotten Skills book and was intrigued by the idea (probably because I’ll never get my hands on enough good fresh apricots to make jam, lovely as apricot jam is). I wonder if it seems counterintuitive to make dried fruit jams because, in a sense, dried fruit is already “preserved” isn’t it? Sara, I do understand what you’re saying. However, if all you have is dried apricots and what you really want is jam, then why not? 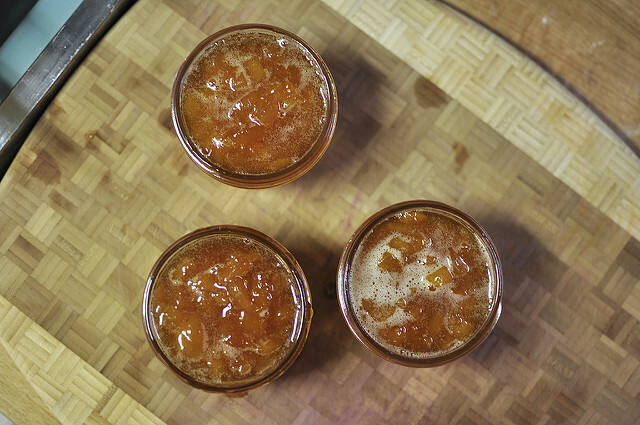 Hm, my brain is wondering how delicious it would be if you soaked the apricots in booze first? Hmm. Well, the water does serve as the liquid in the jam. 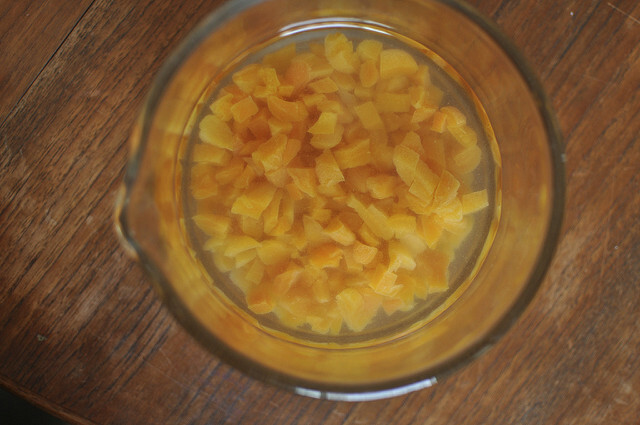 You could try soak the apricots in a little booze first and then add the balance of the water and soak them some more. When mine were done soaking, they’d nearly absorbed all the liquid. I was thinking the same thing! Apricot brandy. My aunt makes a sweet bread and she always soaks the apricots in apricot brandy and swears it makes the apricot flavor stand out a bit more. Sounds tasty! I did some of my first canning projects this past summer and am also eager for the fruits to begin arriving in a few months! I would love if you could give a newbie like myself a little bit of direction when it comes to canning things using less processed alternatives such as honey rather than white sugar. I tried a few jams using honey and Pomona’s pectin but they were definitely not… right. Thanks for all your expertise! I, also, was wondering if you could soak the apricots in brandy rather than water. Or a mixture of water and brandy. What do you think? Oh, how lovely! And we’ve recently run out of our Italian Prune Plum preserves that I made this summer. I love dried apricots. I can only imagine how delicious a jam made out of them is! Thanks for this great post. I’m new to canning – I’ve successfully canned pickles but haven’t tried my hand at jam. This is a great way to start. And to boot, it’s so easily gluten free! I’m so glad you found and posted about the book! I’ve just ordered a copy 😉 I love apricots, but not the texture… I have to try this jam! Yum, thanks for posting this! I just was eating an apricot bar that must have had dried apricot jam on it — the taste and texture were definitely dried apricot, but the gooiness was all jam. This would be so good on a streusel. Do you think this recipe could be easily made with the same amount of other dried fruits? I’m not sure how this recipe would work with other dried fruit. You could certainly try it, but again, I have no idea what the results would be. One thing to consider is that even when dried, apricots are still quite tender. Some dried fruit (I’m thinking of dried peaches, for example) get really hard and tough after drying. I don’t know that they’d reconstitute as well. Good thought. I was specifically thinking of dried dates, which depending on their age can still be rather moist. I can’t wait to try this! After having made apricot jam only once, I believe it is my new favorite. And now I can make it before summer! I was thinking white wine instead of brandy, as I believe the brandy would over power the delicate flavour of the apricots. Enjoy the blog very much. Also, thank you for the book recommendations, I have purchased two, Easy Canning and Preserves and Canning for a new generation. These will be part of a birthday gift for my daughter who has been trying her hand at preserving. This is great! I can set the apricots out to dry in the hot summer sun, then jelly them in the winter when I welcome the excuse to stand over the hot steamy stove! Brilliant! I’m tempted to try this with dried strawberries. I assume I’ll need a bit more water and cooking time, as strawberries are harder when they are dried. I made jam with 2 quarts of strawberries I’d frozen, lemon, sugar, and about 6 ounces of chopped, dried strawberries. It made about 2 pints, and is the most flavorful strawberry jam I’ve managed. I just threw the dried bits in with the strawberries as I started to cook them down. They are plenty tender in the jam, and there’s a bit of textural interest that I don’t usually get out of just plain strawberry jam. This sounds fantastic! I love apricots, dried or fresh. And, a nice small batch to can in the winter is a great idea. I think I’ll head over to Powell’s this weekend and pick up the book! That sounds like my mom’s apricot lekvar (yiddish for jam?). I’ll try to recreate my mom’s recipe by making it without the vanilla, with some lemon zest and a dash of lemon juice, and put it all in the blender or food mill after soaking and before canning. YUM! Wonderful! Love apricots. Love apricot jam. Was spoiled as a child with 5 BIG apricot trees. No apricots now compare to those. But this should work out as a great alternative. But I am somewhat confused – and may just have to buy the book to find out (!) – what you listed is the half recipe, right? So simply doubling it should result in a few half pints of jam?? Pete, the recipe I listed was my half batch adaptation of the book’s recipe. The book’s version yields three pints. I just tried this, using half unsulphured dried apricots and half dried mangoes (Mom’s way of dealing with the sudden out-of-season burst their trees just had). The flavor was developing really nicely, but this batch of jam was the most violently spitty batch I’ve made so far – even though it came up only 1/3 of the way in the deep pot I used, splatters got on the stovetop and the floor. The jam spat up harder when I stirred it. While I was plate-testing, it scorched. Filled four half pint jars, so I also feel like it didn’t reduce enough. I want to try this again, but I’m not going to cook it over high heat, and I think I’m going to try making citrus pectin to help thicken it and balance out the sweetness of the fruits. Yikes, I’m sorry to hear that you had so much trouble with the recipe. I didn’t experience the splatter that you did, though it could be that your high heat is higher than my high heat. Also, it’s a good idea to always reduce the heat or remove the pot from the heat during the plate test, to avoid that kind of scorching. Yeah, not taking it off the stove during plate testing was a mistake I won’t be repeating! I think it’s also an example of when I should listen to myself instead of going “well the recipe says this…” while something dangerous is happening. A couple of years ago I scouched some apple butter I was making. It was to noticeable for ham, so I added a few drops of liquid smoke (on the theory: if you can beat them, join them). I ended up using it on pork chops and it was wonderful! So if your jam ends up with a slightly scorched taste, you might want to try this, and use it as a BBQ meat marinade. just wondered if you could soak the apricots in boiling water to hurry the process? Love your ideas! Thanks so much! I am struggling with the idea of 2 Tablespoons of vanilla in this. Tried it once, and all I could taste was the vanilla. I’m going to greatly reduce the vanilla this time because I really want to taste the apricots instead. Otherwise, it jelled properly and all that, and it tasted good, just not like apricots. I am glad to have found a recipe without pectin. Will try this definitely! Here’s a question – I’m not crazy about the texture of marmalade, and this seems like it might be fairly “chunky.” What do you think about putting it in a blender before canning it to smooth it out a bit? Also, what about the addition of rose water or rosemary? Would you add other elements with the lemon or with the sugar? I just made this recipe. It is manageable for the first time jam maker. I didn’t use vanilla since I like the flavor of apricots by themselves. It made 2 7/8 cups (barely 3 half pint jars). I will definitely double or triple the quantity next time to make better use of the time involved. I’m looking forward to trying it in a couple weeks. I’m not sure if the same rule applies when not using pectin, but I’ve read that it is best to let jams set for 3-4 weeks before opening (to let the flavor develop). Also increase the water bath canning time for higher elevations. 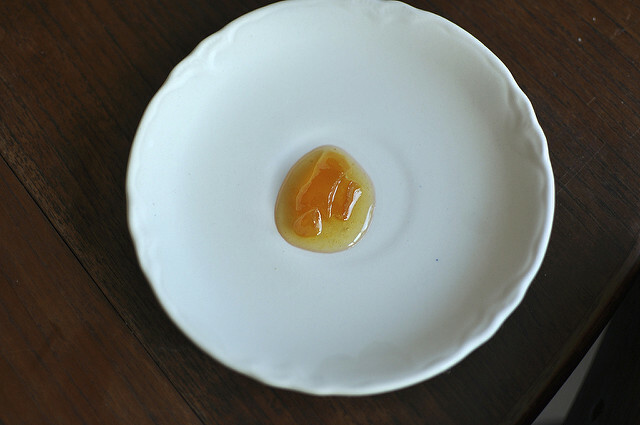 Fun recipe to make without pectin. I make apricot jam regularly…every 4 to 6 weeks….I do not use any additives….I soak 3 or 4 cups of apricots overnight or about 8 hours in water that covers apricots by about 2 inches over top of apricots. Then I put them on stove and turn heat on medium and bring them to a boil..time the apricots from this time for 30 minutes…do not let them boil dry…take from heat and mash ……..cool and refridgerate…. Sugar is not needed…it makes jam too sweet. If jam is too thick a few tblsps of water will make it less thick. Comparing fresh fruit apricot jam with dried fruit apricot jam is like comparing apples with oranges….But both are delicious. I made this recipe today and will have to throw it out owing to the error of vanilla extract listed in the ingredients. It is inedible. When I searched on the web for the equivalent of 2 Tbsp brandy, spirits, or liqueur, several sites listed 1/2 to 1 tsp of vanilla. I hope the author of this website will do her research and alter the instructions. Such a waste of time, ingredients, and anticipation. Judith, I am so sorry that you had trouble with the recipe. It’s been years since I posted this and can’t even begin to tell you why I wrote 2 tablespoons vanilla extract. My apologies. I’ve changed the recipe to use a more modest amount. Hi Marisa, Thanks very much for responding to my post and for changing the vanilla amount. I think this will be a tasty jam and I look forward to making it again, along with your other recipes. One thing I did love about this recipe was the smaller quantity – I think so many people are put off with most traditional canning due to large amounts of jars/ingredients and the general mess of it all. Keep up the good work! I just made this with amaretto and it was delish. Do you think you could add a little ginger (candied or fresh) to this safely?